Yesterday, while working on OpenMRS I needed to debug some Java code. I could not easily find steps for debugging OpenMRS with IntelliJ on Google, so I decided to write down my findings. I used IntelliJ's Remote JVM option to connect to OpenMRS Jetty server. I updated the MAVEN_OPTS in my home directory's .zshrc file (since i use ZSH shell on Mac). You may need to set the MAVEN_OPTS variable appropriately for your environment (Windows/Linux/etc) so that it is correctly set, before starting Jetty on command line. The value "51696" that I have mentioned above is the port where I want the debugger to run. The memory options have been set because Jetty gives an OutOfMemoryException with OpenMRS if the memory is insufficient (and by default, it seems to be insufficient - so you are better off setting the memory values too). Now, start Jetty normally using "mvn jetty:run". You will notice the following line being printed by Jetty to indicate that debug port has been opened. In IntelliJ, go to "Run" menu, and select "Edit Configurations". Select the "Defaults" option on the left menu, and click on the "+" on the Right side, to create a new configuration. In that Select "Remote" option, and enter options as "localhost" and port as "51696" (same as the port number in step 1 above). Put "Name" as anything you like. I have set it as "OpenMRS Jetty". That's it! Now you can debug using this "OpenMRS Jetty" configuration. On clicking "Debug" you should see the debugger connected to Jetty, and breakpoints will start working. Note: If you want to perform Debugging on Eclipse, then basic process would be the same. Step1: No change. 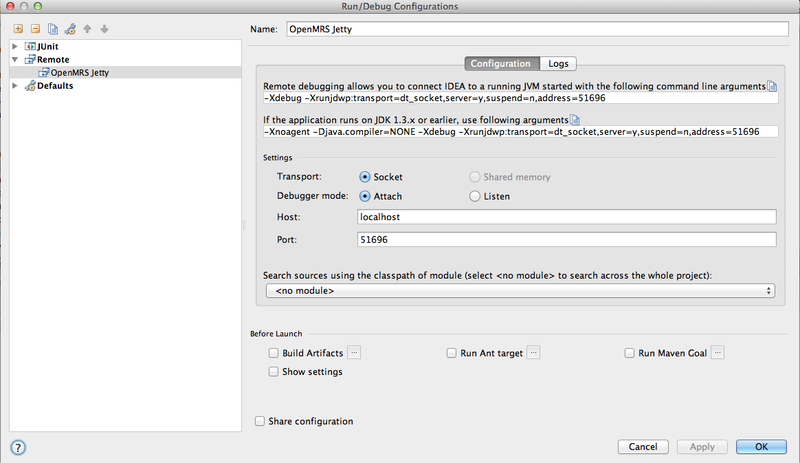 Step2: In Eclipse choose Remote JVM Debugging option (similar to IntelliJ). There are other ways of debugging OpenMRS too, especially if you run Jetty from inside the IDE. But, for me, this method was simpler. You have finished reading Debugging code in IntelliJ for OpenMRS Jetty and many articles about Tech Gallery in our blog this, please read it. and url link of this article is https://littlebitjohnny.blogspot.com/2012/12/debugging-code-in-intellij-for-openmrs.html Hopefully discussion articles on provide more knowledge about the world of new tech gadgets.